On the Friday night after Christmas my Grandpa drove to our house with friends and family to celebrate our anniversary and Tee's first birthday. It was also his 90th birthday and so we all sang Happy Birthday and he was given his own special cupcake with a candle. Happy Birthday to him on his 80th birthday. 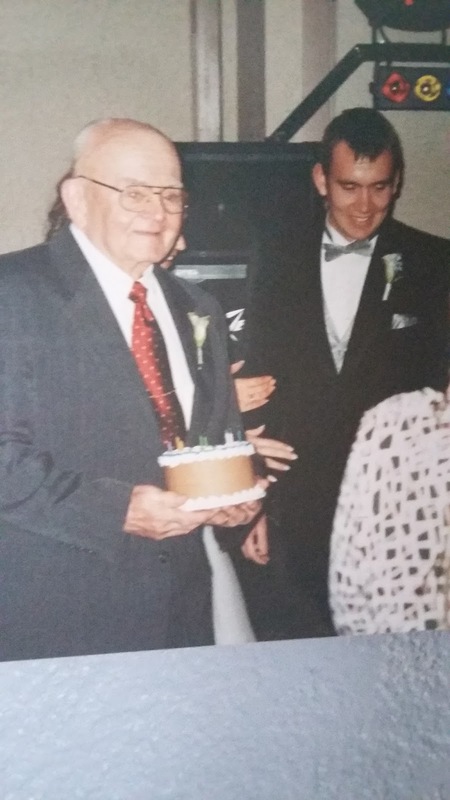 The following Sunday, January 1st, his children, grandchildren, great-grandchildren, and three of his siblings gathered to celebrate his birthday. By the end of the week he was in the hospital and on the following Friday he took his last breath, surrounded by loved ones. 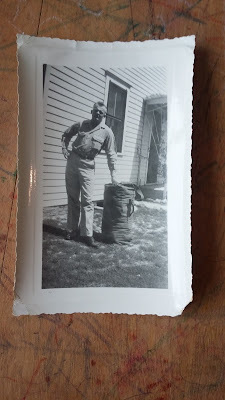 My Grandpa had always been pretty stoic but he had a sense of humor, too. He was a hardworker and a devout Catholic. He was one of twelve children, raised on a large farm, part of a German Catholic family. Every night they kneeled around the dinner table and prayed the rosary, and in many ways his childhood life was similar to reading Farmer Boy except there were trucks and tractors and the Korean War to call him away to service. I don't know if he ever told me that he loved me but I knew that he did, and he delighted in my children. In the last couple of years we lived in the same town and attended the same 7am Mass. Often, after Sunday Mass we would buy donuts and burritos and head over to his house for breakfast. I hope they will remember how he'd have the kids guess Heads or Tails as he flipped quarters and when they won they got to keep the quarter. Once each one had four he'd trade them for a dollar. He'd play Go Fish with them, too, calling my boys Ben, Jim, and Joe like they were all little old men. He was consistent and prayerful and cared about his family. He lit a candle every Sunday after Mass until James was walking. (That's over a year of lighting candles and praying for my son's health and healing.) For dinners and parties he'd come early and leave early to "go home and watch the ballgame." He never missed a performance, sitting through who knows how many middle school and high school concerts and games and then even attending my kids' Christmas concerts and all school Masses. He caned chairs, built me a Barbie dollhouse, worked hard, and once painted an entire side of my parents' garage so he could show me how it's done. I am grateful for how everything happened. There was enough time for me to bring him the St. Joseph holy card L picked out for him, for me to tell him that the kids were praying for him and were having their classmates pray, too. I was able to hold his hand and tell him Thank You for all the things he had done for us, to tell him I love him, and a few other things, too. Our priest came several times to pray and offer Last Rites and gave an apostolic blessing. His funeral was beautiful, thoughtful, and very personal. Eight year old L and seven year old Ben led the rosary beforehand and did a great job. The seventh graders came from the school to attend so they could pray for the dead and the children's choir sang - an unexpected and beautiful surprise. The women from my small group came with their children - all of them had sang Happy Birthday to him just two weeks before. Travis and I went to the house yesterday to walk through and make note of the things we'd like to have. 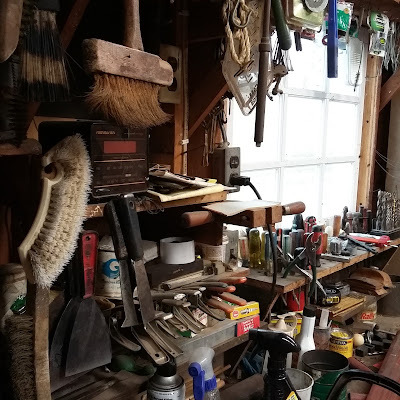 Every room has memories but his workshop was probably the most nostalgic. I could almost smell the sawdust and kerosene. I guess I'm just writing this out because I want to remember him and I want my kids to have a record that there was this man who did so much for us and loved them so much. He was a good man who lived a long, good life and a long, good life leaves a pretty big hole when it's gone. I miss him, as I miss my Grandma who went a year before him. Our foes press hard on every side; Thine aid supply; thy strength bestow. To thy great name be endless praise, Immortal Godhead, One in Three. O grant us endless length of days, in our true native land with thee. I'm so sorry for your loss! He sounds like such a wonderful man who lived a full and beautiful life! Eternal rest grant unto him, O Lord. This is a wonderful tribute to your grandfather! My sympathies and prayers for your family and his soul! This is a beautiful post, Bonnie. Thank you for sharing your grandpa with us. This made me think about my grandparents and how I wish my kids could've had more time with them. Your grandpa will be in my prayers, as well as your family. Love you! Sounds like your grandpa lived a beautiful life and was blessed with a beautiful death. There's not anything more we can hope for, really. So sorry for your loss. May you find comfort in the faith you shared with your grandpa. This is so beautiful. Thanks for sharing! I'm so sorry for your loss. He sounds like a wonderful man. I know that workshop smell. Maybe our grandpas will build things together in Heaven? I'm sharing in your grief through my own grief and praying for your family every day. What a beautiful post, Bonnie. It sounds like your grandpa loved well and was well loved. Hugs to you and your family.